I have been taking photographs of a dilapidated barn in Ste. Catherine de Hatley, Quebec, for a number of winters, in different weather conditions, in the hope of using it as the basis for a wallhanging. The wood has aged each year, and the barn has become more skewed and uneven with time. The wood tends to look grey on cloudy days, and browner when the sun is shining. On the sides, pieces of sheet metal have replaced some of the missing wood planks. Occasionally I catch a glimpse of a purple plastic crate or two when I look inside from the side. Whenever I have stopped to photograph the barn, the doors are always closed, and one cannot catch even a glimpse of the contents from the front. This piece is the second fabric study I have made, preparatory to creating a larger piece. The top section of the barn was created using string piecing on a muslin (calico) foundation. 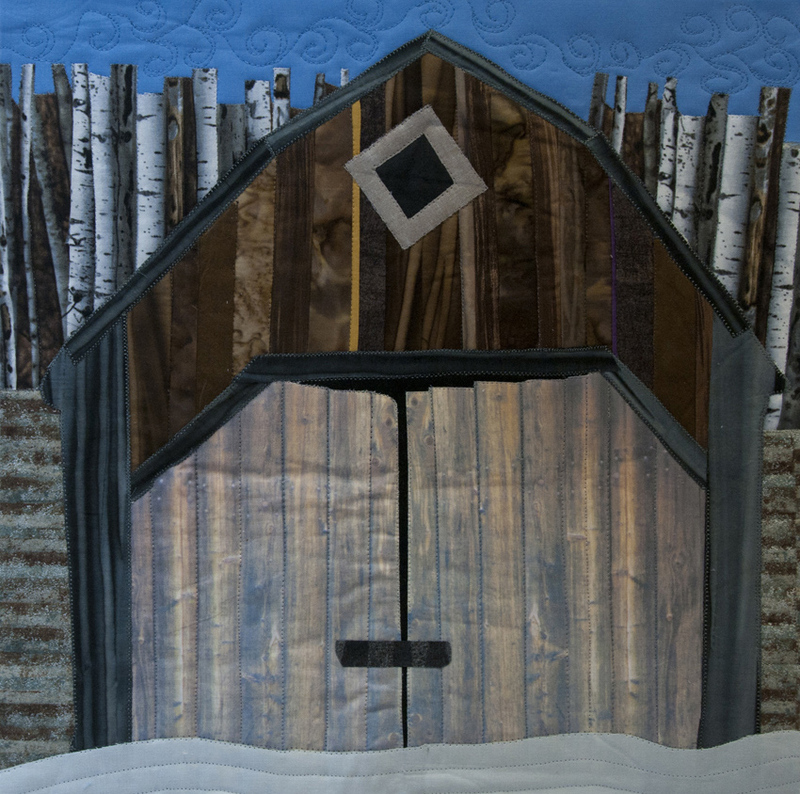 The barn doors are made from a photo transfer fabric, using photographs of the barn door. 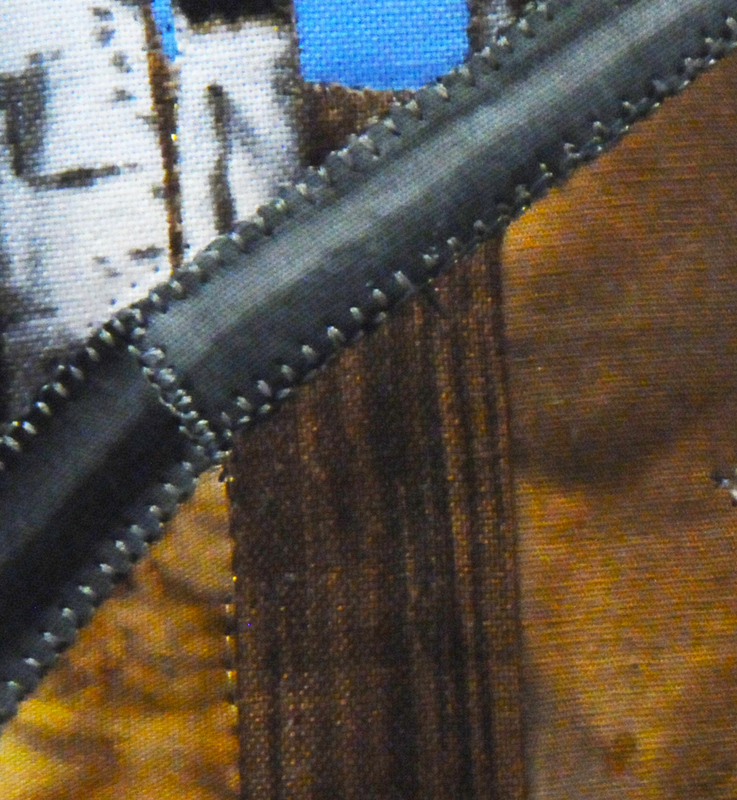 The remainder of the piece was created with fusible raw-edge appliqué. The quilt uses hand dyed fabrics, batiks, and commercial screen printed fabrics, and I chose to use a wool batt to give it dimensionality. Rivi===Thank you for your kind remarks. It is fabric! But leather could be a thought for the final project. And here I thought you skied in the Laurentians, not the Townships! I had cousins in North Hatley at one time…so when you mentioned the location of ‘your’ barn, I had to find it on the map! Your rendering is wonderful; I think you’ve captured beautifully the light/shadow and ‘wonky’ aging of the barn door. Rivi–_Thank you for your kind words. I had not thought of using leather. Leather might be a good idea for the final project! Beautiful interpretation. I agree with Margaret the rendering of the barn is wonderful. I was immediately drawn to the birch stumps in the background! Lovely idea. Well done for a brilliant interpretation. I really like how you have used the photo transfer technique. I love the way you make the combination of fabric transfer and string piecing for the barn. Lovely birches behind the barn. I love the old barn photo too. I often wonder about the history of barns such as this one. Perfectly portrayed with all the techniques you have used.